#ECCMID2015 took place in Copenhagen. It was a great venue with a lot of interesting sessions. My favourite presentation was by Dr Paul D Cotter. We have had the pleasure of doing some work together with Dr Pauline D Scanlan as the main driving force. In his talk, Dr Cotter highlighted the emergence of research exploring whether certain organisms are pathobionts or probionts; among these, Blastocystis. Among many things, Dr Cotter reviewed the two recent Blastocystis-specific publications by Scanlan et al. focusing on the commonness and stability of Blastocystis colonisation  and on the need to use subtype-specific PCRs to detect and identify mixed subtype colonisation/infection . Based at TEAGASC - Ireland, the Cotter/Scanlan group is one of the teams interested in looking into the ecology of Blastocystis (and other microbial eukaryotes of the gut), including its influence of the parasite on gut microbiota/microbiome (structure and function of our all gut organisms) and vice versa, and I'm sure that there will be a lot of interesting data coming out from their lab in the near future. Cotter mentioned that Blastocystis has been subject to bad science. This may be due to a number of reasons. When developing hypotheses, we have a tendency of opting for dichotomous outcomes - either it is this or that, - maybe that's the very nature of hypotheses. If the clinical significance of Blastocystis is dependent on a number of different things such as co-colonising microbes (cross-talk), differences in host immunity response, Blastocystis subtype, and host diet for instance, then the true tapestry of physiological/biological/clinical mechanisms is likely to be extremely difficult to uncover. Moreover, despite the fact that so many people are curious about the public health significance of Blastocystis, apparently very little funding for targeted Blastocystis research exists. This means that mostly minor and not so significant studies ("cheap studies") on Blastocystis are available. Relatively little seminal research has been done in the clinical field (including the field of gastroenterology), and most studies on Blastocystis are cross-sectional and descriptive and usually not very well designed/carried out (use of diagnostic tools with limited sensitivity, for instance). 1) Large studies of both diseased cohorts and healthy individuals, including Blastocystis subtype data and data on accompanying protists, bacteria and fungi (16S/18S/ITS profiling). 2) Manipulaton studies where Blastocytsis (cysts) are introduced in ecosystems (in vitro or in vivo) to monitor potential changes. 4) Longitudinal microbiome studies of patients with and without Blastocystis. 6) Comparative genomics (virulence gene identification for instance). 7) Identification of Blastocystis-specific signatures in metagenomics data sets. 8) Identification of drugs that have anti-Blastocystis properties, since currently, there is no drug regimen that consistently enables eradication of Blastocystis. Speaking of which: We just published data in Journal of Ethnopharmacology on the anti-Blastocystis activity of 24 plant parts from 21 medicinal plants from Ghana . We performed in vitro challenge of 48 h Blastocystis cultured cells (subtype 4) using ethanolic, warm and cold water plant extracts. Screening of these 24 different plant parts showed significant anti-Blastocystis activity of six of the ethanolic extracts: Mallotus oppositifolius, IC50, 24h 27.8 µg/mL; Vemonia colorata, IC50, 24h 117.9 µg/mL; Zanthoxylum zanthoxyloides, cortex IC50, 24h 255.6 µg/mL; Clausena anisata, IC50, 24h 314.0 µg/mL; Z. zanthoxyloides, radix IC50, 24h 335.7 µg/mL and Eythrina senegalensis, IC50, 24h 527.6 µg/mL. The reference anti-protozoal agent metronidazole (MTZ) had an IC50, 24h of 7.6 µg/mL. Since cultures were xenic, antimicrobial activity was tested against two Gram-positive and two Gram-negative bacteria for all 24 plant parts at a final concentration of 1 mg/mL. Only C. anisata showed antimicrobial activity at a concentration of 800 µg/mL. Hence, M. oppositifolius showed nearly as good activity as the reference anti-protozoal drug MTZ. Historically, the active plants found in this study have been used against dysentery, diarrhoea or other stomach disorders. Nowadays they are not used specifically for dysentery, but they are being used as medicinal plants against various stomach disorders. Our book 'Biology of Foodborne Parasites' is out and available for ordering. Incidentally, Blastocystis earned a designated chapter in the book 'Biology of Foodborne Parasites' which is now out and available for ordering here. It was fun writing it up, and hope that the chapter will be of interest to health care professionals and students around the world. 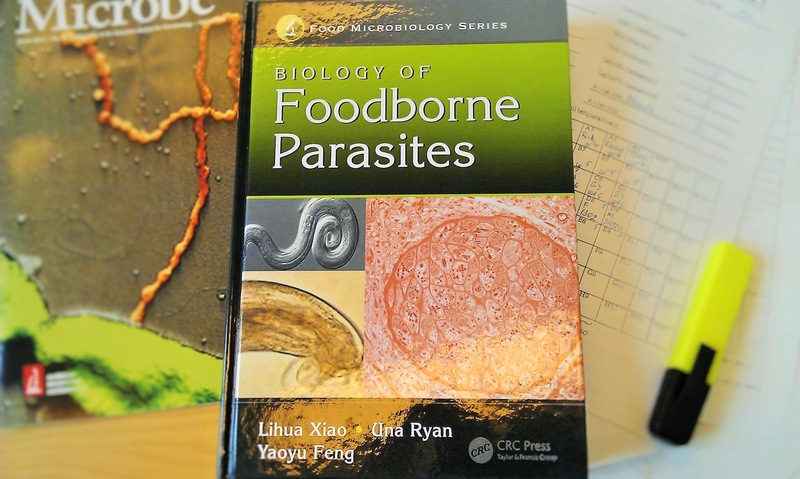 The book also contains introductions to the public health importance of foodborne parasites, molecular biological techniques in studies of foodborne parasites, and detection of parasites in foods.